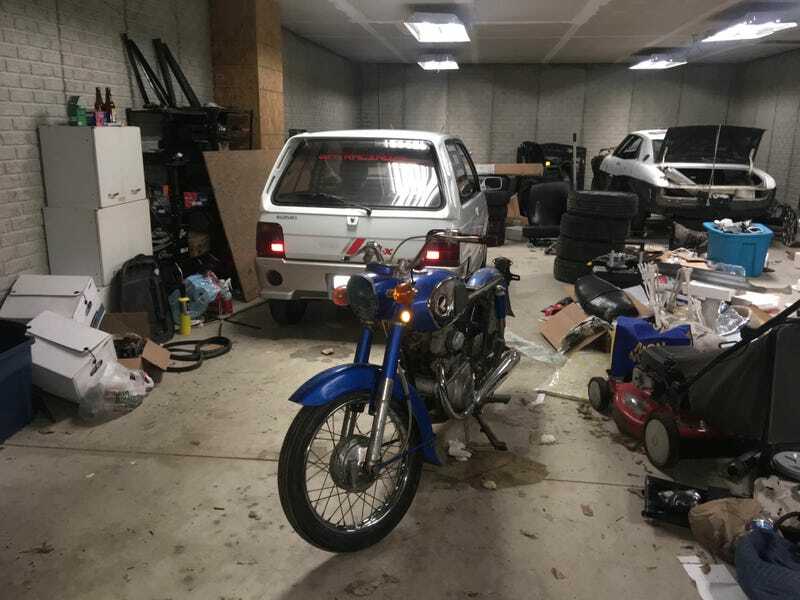 Dogapult Motorcycle Ownership, Part 2: CD175 checking over. took both spark plugs out. one was NGK, one was Champion. they both looked brand new. the hole where the Champion one was has fucked up threads. Noticed the seat only had one bolt holding it on. took that off, went to the hardware store to get two new bolts. That one was SAE. Bought two metric bolts. Went to put them on, of course, the side where the SAE one was won’t thread in. Checked the points. they looked great. Tried to get the stator cover off. nothing doing. sprayed some PB Blaster on the screws. bought a battery. Need to put acid in it. Bought a nice heater for the garage so I can work in the winter. Going to clean up the threads, spray the carb out with some carb cleaner, and hook up the battery (with acid in it) on Sunday, when my more motorcycle-literate friend will be here. In the meantime, filing for lost title. Enjoy the picture of my messy garage.